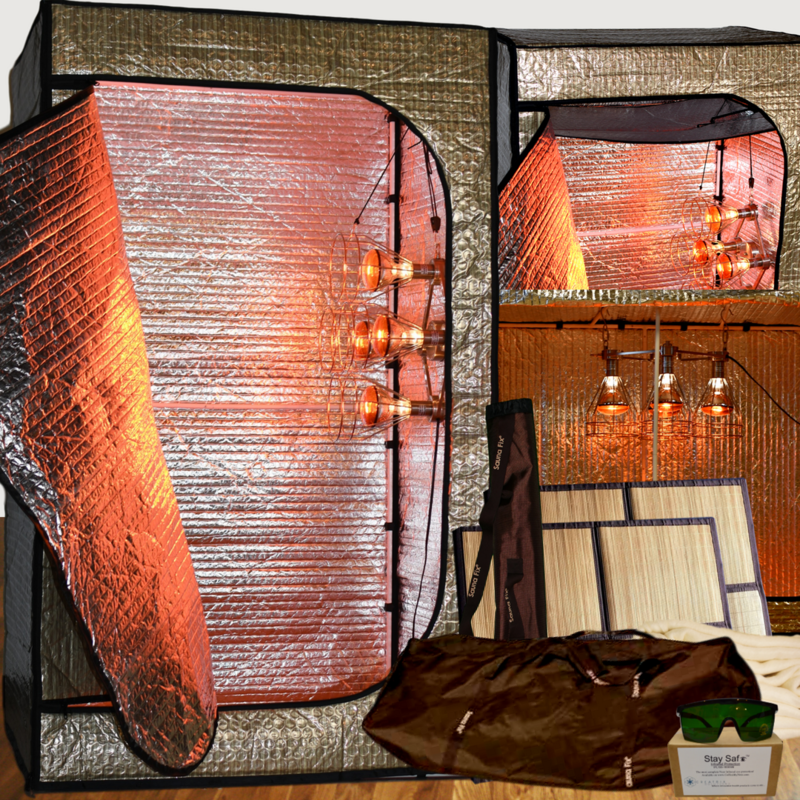 Shop Sauna Fix® Near Infrared Sauna Portable Indoor Radiant Tents Today! We have improved the Sauna Fix® radiant sauna tents based on client feedback. As a result, we are now offering the patented Convertible Radiant Sauna Tent and Hot Yoga and Exercise Sauna Tent that are larger, sturdier, more eco-friendly and versatile, and easier to use. The US Utility Patent was granted on July 3, 2018 for the Portable Radiant Exercise and Sauna Tent, which features two exclusive designs. The exterior of the new tents has an inviting golden wood grain design, and the chocolate brown zipper is 100% organic and looks better than the one on the original silver Sauna Fix® tent made in 2015. The panels are made from five layers, including nontoxic wood grain film, space blanket, large diameter bubble wrap, space blanket, and nontoxic film. Our one-of-a-kind tent sauna systems retain up to 95% of heat and carry an "A" fire safety rating. The Convertible Sauna Tent lets you perform sauna sessions in 3 different positions: lying down, sitting, and standing. Just use the radiant tent panel insert to lower the ceiling to that perfect height and enjoy your NIR sauna session in a seated position. The larger Hot Yoga Exercise Sauna Tent has enough room for practically any type of workout and comes with an easy-to-install partition to divide it into 2 separate chambers, so that two people can take sauna simultaneously. The new tents currently come with the bamboo mats that have the radiant back. They work best with the new version of Sauna Fix® near infrared lamp (coming in November 2018), the only non-toxic, portable, medical grade, energy efficient, accessory-inclusive NIR sauna system in the market that offers such ion and oxygen-rich and low-EMF sauna session experience without costing a fortune.